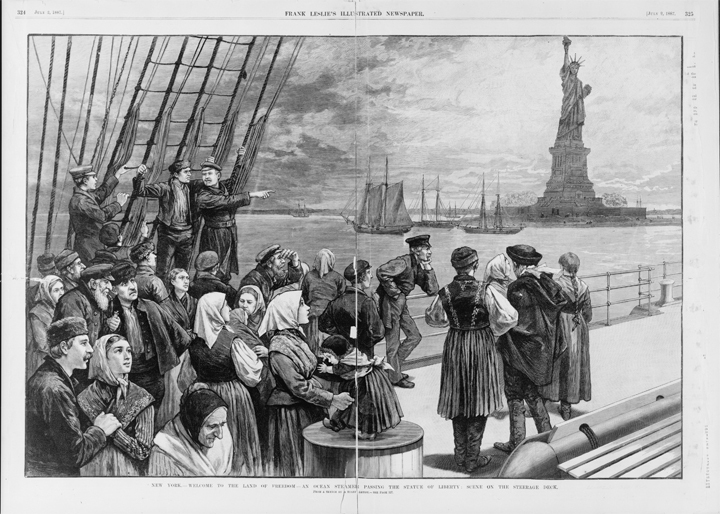 Immigrants arriving in New York harbor with the Statue of Liberty in the background. New York - Welcome to the land of freedom - An ocean steamer passing the Statue of Liberty: Scene on the steerage deck of steamer “Germanic” / from a sketch by a staff artist. Illus. in: Frank Leslie’s illustrated newspaper, 1887 July 2, pp. 324-325. Via Library of Congress. American Jews have long remarked upon the unusual freedoms offered them in the United States. In 1790, Rebecca Samuel wrote to her family in Germany from her home in Petersburg, Virginia that they "could not know what a wonderful country this is." Her husband could choose to labor in any way he liked because no guild system restricted him, and so he was both watchmaker and silversmith—as Americans expected one person to master those two linked trades. His brother would arrive soon to join him in business. Rebecca judged Virginia the most welcoming of any part of the United States, and assured her family that "[a]s for the Gentiles, we have nothing to complain about . . . One can live here peacefully." Samuel's sentiments were not unique. The now famous letters exchanged between the Jews of Newport, Rhode Island and George Washington as he accepted the presidency of the United States voiced the appreciation by both parties to the correspondence that in this country, a person could "sit in safety under his own vine and fig tree and there shall be none to make him afraid." Washington used the phrase many times in his writings, and often spoke of his beloved Mount Vernon in those terms. The phrase is, of course, biblical, appearing in Micah (4:14), 1 Kings (4:25), and Zechariah (3:10). No book in early America was more widely read than the Bible, and so it is not surprising that the famous phrase also appeared in a 1787 issue of The New York Journal in a suggestion that America was more tolerant of immigrants than most other countries. Jews pressed Washington to affirm their judgement that the US government would give "to bigotry no sanction, to persecution no assistance," and his reply to them did so. Jews joined a wide chorus of voices praising the country's freedoms. 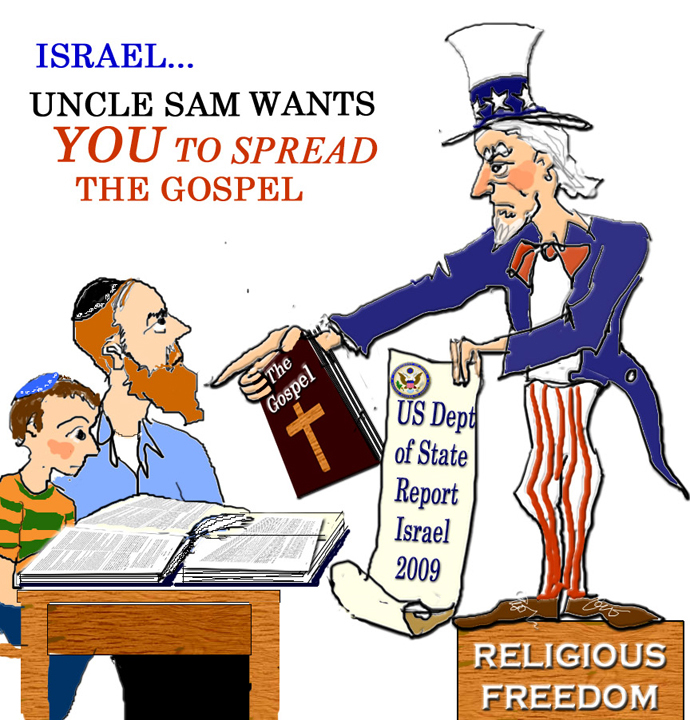 Uncle Sam wants Israel to spread the gospel of Religious Freedom. Credit: Ellen Horowitz, JewishIsrael.com. The constitutional restriction on government interference in religious matters, along with what seemed to many whites to be open and available land, created fertile ground for religiously based communal societies. One such group, the Shakers, settled in the upper United States around the time of the Revolution. Many other communal religious groups, including longlasting innovators like the Latter-Day Saints (Mormons) and others with only a brief existence, such as the Oneida Perfectionists, took shape throughout that century. Perhaps those societies inspired Mordecai Manuel Noah to consider an island in the Niagara River near Buffalo, New York as a refuge for Europe's Jews. There, if they chose, Jews could rebuild their own familiar small towns. Despite its name, Grand Island is a relatively small place. But, as the land near the western end of the new Erie Canal became valuable— connecting the farms of the upper Midwest to the Atlantic Ocean via the Great Lakes to the port of New York—Noah purchased land on the island and named it Ararat, after the spot where Noah's Ark was said to rest. In 1825, as the canal opened, he advertised the colony in venues where Europe's Jews could see and understand his offer to sell them plots of land there. No one came. Did they not understand the economic promise of the nearby canal or the freedoms they would enjoy in the United States? We don't know. Perhaps they looked at a map of the Niagara River and worried about the enormous torrents of water rushing over the falls into the whirlpool below only a few miles downstream from the island. 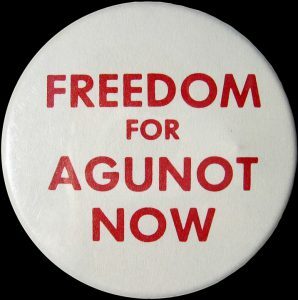 “Freedom for Agunot Now” (Orthodox Jewish wives unable to receive a religious divorce). Pin created by Agunah, Inc., and GET. The Jewish population of the United States did grow throughout the nineteenth century, despite Jews' lack of interest in Grand Island. They settled in cities with established Jewish communities along the Atlantic coast, and they settled in small towns in the South and Midwest where peddlers could bring manufactured goods from cities to farmers throughout the countryside. New railroads tied towns together and promoted the growth of midwestern cities like Cincinnati, where the new Reform movement grew up among Jewish young newcomers mostly from Germanic areas of Europe. By the time of the centennial of the Declaration of Independence in 1876, when the country held a huge celebratory fair in Philadelphia, roughly 250,000 Jews lived in the United States. 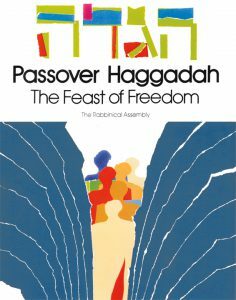 Reproduction of the cover of Passover Haggadah: The Feast of Freedom (The Rabbinical Assembly, 1982) with the permission of the publisher. Reform leaders rethought Judaism according to contemporary ideals and sometimes reimagined sacred stories. 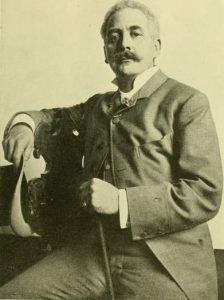 Isaac Mayer Wise, the rabbi who led the movement, wrote a novella retelling the story of the ancient Maccabean revolt. In Wise's hands, the revolt became a battle for religious freedom. Published in serial form in his weekly magazine that reached most of the country's Jewish settlements, the idea took hold. By the twentieth century, Jews often referred to Hanukah as commemorating the first battle for religious freedom. Passover, too, became a holiday that commemorated freedom, as the liberation of ancient Hebrew slaves was understood by Americans. 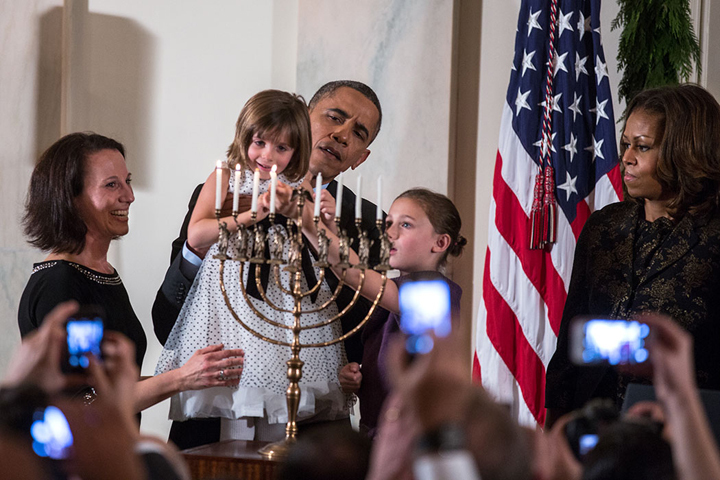 President Barak Obama and first Lady Michelle Obama with children lighting a Hanukkah menorah in the White House, Dec. 5, 2013. Official White House photo by Lawrence Jackson. “Religious Liberty” sculpture by Moses Ezekiel. Photo by Wikimedia Commons user Smallbones, 2012. Clubs, municipalities, businesses, and other entities created exhibits and objects for the centennial. The city of Philadelphia erected massive exhibition halls and impressive sculpted gates to the fairgrounds welcoming visitors from around the country. The B'nai B'rith, a Jewish men's society formed in 1843, was among the many exhibitors. 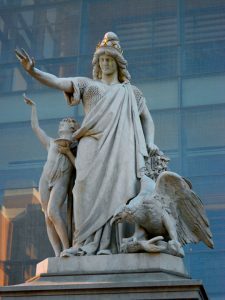 Their gift to the centennial was a large marble sculpture titled Religious Liberty, comprised of three posed figures of a woman, a child, and an eagle. It was created by sculptor and artist Moses Ezekiel, who graduated from the Virginia Military Institute—the first Jewish cadet to do so—as well as from the Berlin Royal Academy of Art. He had served in the Confederate military and had been wounded in battle in 1864. Today, the large white marble work stands near Philadelphia's Independence Hall in front of the National Museum of American Jewish History, where large white letters spell out "Only in America" high above the statue. The two built objects seem to reinforce each other. Monument. (United Daughters of the Confederacy, 1915), p. 9; via Flickr Commons. Ezekiel never married, although he did father a child with the African American woman whom one website refers to as his maid. American freedoms did not extend to all the population before the latter decades of the twentieth century and its parameters and practicalities remain topics for national debates. Jews benefitted from the ideal of "freedom of conscience" so treasured by the diverse Protestant Christians who comprised 90 percent of the white population at the time of the Revolution, from their European ancestry, and from their relatively small and unthreatening numbers. By the time Emma Lazarus's poem "The New Colossus" won the 1883 contest to be placed on the pedestal for another female image of liberty, that of Bartholdi's statue, Liberty Enlightening the World, the pace of Jewish immigration had picked up substantially. It would continue through 1924, when Congress sharply restricted immigration. Until then, Lazarus's Mother of Exiles beckoned to Jews who arrived in New York from eastern areas of Europe and the Levant, comprising some of the "huddled masses yearning to breathe free." Lazarus's phrase and the statue above it continue to embody a key theme in the national conversation. Dianne Ashton is professor of Religion Studies at Rowan University and the editor of the journal, American Jewish History. She is the author or co-editor of five books and more than thirty scholarly articles about Jewish life in America. Her books include Four Centuries of Jewish Women's Spirituality (Beacon Press, 1992; revised ed., University Press of New England, 2005), the first modern biography of Jewish education trailblazer Rebecca Gratz, (Wayne State University Press, 1997) and, most recently, Hanukkah in America: A History (New York University Press, 2013).